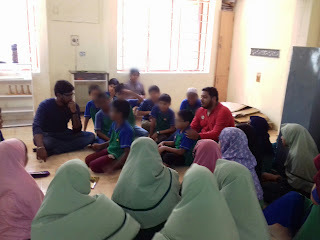 Another out of the world pre history workshop at the Sharma Centre for Heritage Education for Al Qamar Academy students. The Elementary students learned about stone tools, then got to make their own tools. They used the tools to cut grass. 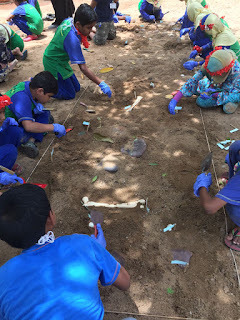 The high point of the workshop was where they went on a "dig" - working carefully, they brushed away the mud to find a skeleton. And some shells nearby. Like real archaeologists, the children had to reconstruct what happened to this old skeleton. From "He was murdered by a stone and died, to he was drowned (hence the shells), some of the explanations did take a macabre turn, but were accepted as valid by Dr. Shanti Pappu who didn't bat an eyelid. "Awesome", "The only shortcoming - it was too short", "the best class ever", were some of the ways the children described the workshop. Keep going Shanti Pappu & Dr. Akhilesh - you guys managed to make prehistory a fascinating subject for the kids.